Yours might not be pink (probably white) but it really depends on what it has been eating which defines what colour it is. The above planaria has probably eaten some coloured flake food (which they love). 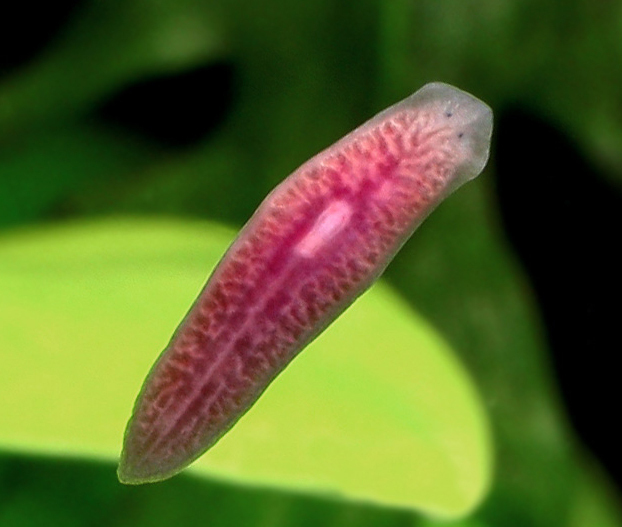 Planaria appear in lots of different aquariums and often arrive in plants – but it’s very difficult to identify where they originate from. If you have fish in your aquarium, then you’re in luck as fish love them and snack readily on them (very satisfying to watch…).If you look at your tank closely, planaria move around on glass and in the substrate – they’re surprisingly fast too. They eat fish food (predominantly) and to a degree, can be controlled by ensuring you’re not feeding too much. I’ve also seen them eat snails, snail eggs, fish eggs, shrimp and so on. I’ve also seen one trying to eat the eggs of a pregnant cherry shrimp (fortunately she wriggled away). Many hobbyists who keep aquariums without any fish but shrimp struggle to get rid of planaria once you’ve got them. No matter how many water changes you do and how clean the substrate is, it’s very hard to get rid of them until now. Genchem No Planaria is a unique powder that can be added safely to any aquarium with or without fish and is totally harmless to shrimp. It’s biodegradable and uses a natural product called Betal Nut Palm Extract. Dosage is very simple done over 3 days and we have used it in one of our shrimp tanks and no losses. Even the pregnant cherries were fine so we’re very confident in recommending this product to anyone. If you have used this product, we would love your feedback.